This is a very useful tool which is a combined unit. Use the voltage checker to check for live circuits when fault finding or doing repairs/replacements. Use the continuity checker for fault finding and also for checking fuses and checking light bulbs. You can buy separate tools for doing this but I prefer a combined unit. For live testing the probes are specially designed so that all but the very tips are insulated which help reduce the risk of shock or causing a short circuit when testing. Testing that a socket outlet is not live prior to working on it. Professional quality combined voltage and continuity checker. 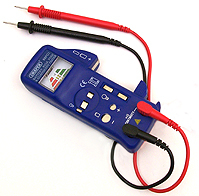 For a low cost option you could buy a separate single probe mains tester and continuity checker. 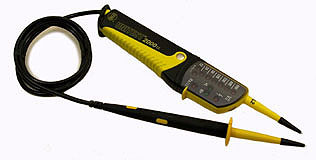 The mains tester below is a single probe type which makes it easier to use. This one also comes supplied with a safety gate for testing plug sockets without having to unscrew them. The ones shown below are good quality items. Don't buy cheap rubbish as it may let you down. A good quality mains tester.